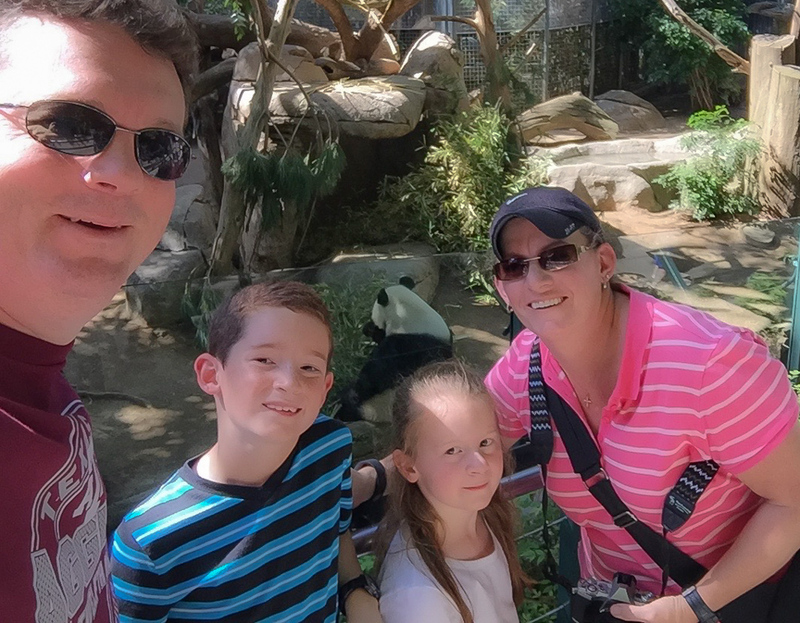 There were many wonderful adventures we had while we were visiting San Diego, but one of my favorites was The Barlin-Kahn Family Panda Trek at the San Diego Zoo. I’d always heard about the San Diego Zoo panda bears but had never been before. Like most of the enclosures at the San Diego Zoo, we felt like we were very close to the panda bears and could clearly see them in a very nice habitat. And here we are taking our totally cheesy selfie with Bai Yun! We tried to quietly get her to look at the camera, but she was busy eating!! After waiting in line for about 30 minutes, we took our time and really watched the bears for as long as we were able to – which wasn’t nearly long enough. There were lots of people wanting to get a good look at the pandas. 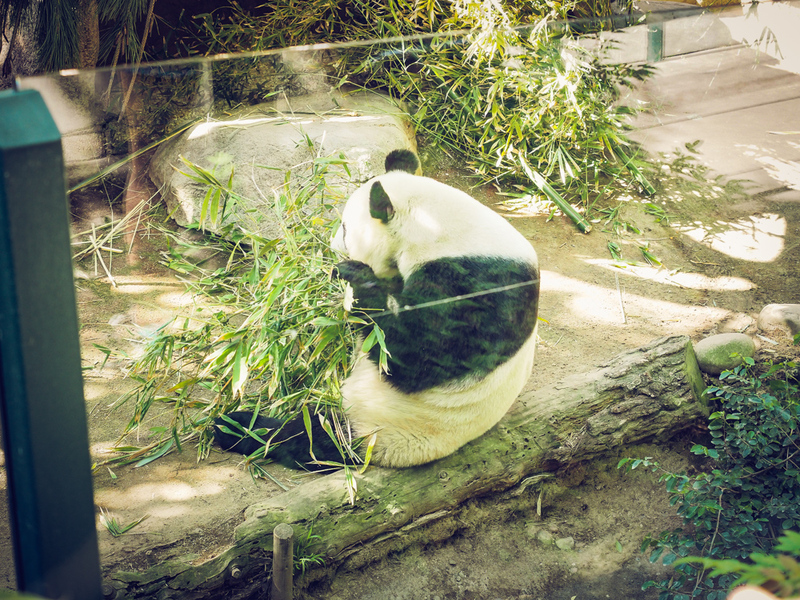 There’s something about a panda bear – they make me want to sit down with them and snuggle. I could be reading a book, while my little panda friend nibbled on some bamboo! Who doesn’t love a panda bear? They look like giant stuffed animals to me! These giant panda bears are a national treasure in China. They are protected by law in their bamboo forest homes. The panda bear has long been revered by the Chinese and is often found in Chinese art. When we were at the San Diego Zoo back in April (2016), we got to meet a couple of these bears. We met Xiao Liwu, also known as “Mr. Wu,” and Bai Yun. Mr. Wu is the 6th cub born at the San Diego Zoo to Bai Yun – one of the oldest giant pandas to give birth. Mr. Wu was born on July 29, 2012. What a little ham he was. 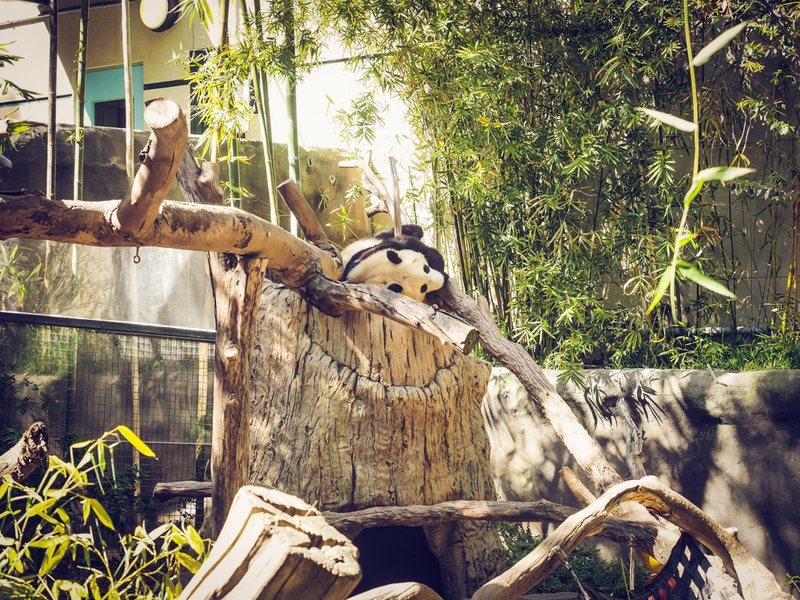 And here is Mr. Wu playing on his tree stump while his mom eats some bamboo (over in her own space)! Mr. Wu was rolling around and playing in the Panda Habitat on the top of a very large tree stump, while his mom sat quietly (by herself) with a stack of bamboo she was chewing on. Pandas are solitary by nature, and they need (and want) their own space. I didn’t know that pandas require up to 36 pounds of bamboo every day to survive. Bai Yun was well on her way to getting her 36 pounds when we saw her. Nothing was distracting her from that pile of bamboo! Apparently, pandas spend at least 12 hours each day eating bamboo. Lucky! I’m happy if I get a 10-minute lunch break. The pandas are able to grasp bamboo stalks with their fingers, and they use their teeth to peel off the tough outer layers of the stalk so they can get to the soft tissue on the inside. They also like to eat the bamboo leaves. Here is mommy – Bai Yun – eating some bamboo while Mr. Wu entertains himself over on his favorite tree stump! Sorry about the reflection – those silly glass panes really cause me lots of photography grief! In 1996, the San Diego Zoo worked out an agreement with China to house two adult pandas and their young offspring. They have 3 giant pandas, including Xiao Liwu (Mr. Wu – who we saw frolicking in his habitat), Bai Yun (who was happily sitting with a stack of bamboo), and Gao-Gao (the adult male that we did not meet). Their habitat includes trees, climbing structures, and air-conditioned bedrooms. Sounds nice, right?? At the San Diego Zoo, there are two main enclosures. Next to the panda viewing area is the building where the Giant Panda Team stays. This team includes the keepers and researchers who observe and study giant panda biology and behavior so they can learn all about these endangered bears. When pandas are born, can you believe that they are about the size of a stick of butter? They do not have any hair, and they are completely helpless! The panda mom takes great care of the tiny cub – she will usually cradle it in her paw keeping it close to her chest. For many days after birth, the mother does not leave the den for anything – not even to eat or drink! When I was reading about pandas, I had no idea that they make several sounds! I assumed they made some sort of growl if they were mad, but apparently, giant pandas can bleat, roar, growl, honk, and a few other sounds as well! What? Sure wish I had heard some of these sounds at the Panda Trek in San Diego. All we could hear was the rustling of the bamboo leaves that Bai Yun was eating! Here are some fun and crazy facts about pandas… Who knew?? A wild panda eats 23 to 36 pounds (12 to 15 kilograms) of bamboo each day. For a panda, eating that much bamboo takes about 12 hours of the day. Giant pandas are technically carnivores, but they have adapted to live mostly on bamboo. They eat small mammals if they can catch them, though. Like other types of bears, giant pandas are curious and playful, especially when they’re young. In zoos, they like to play with items like piles of ice or sawdust, puzzles made of bamboo with food inside, and different scents like spices. Giant pandas have unusually thick and heavy bones for their size, but they are also very flexible and like to do somersaults. Almost all pandas, including those living at the San Diego Zoo, belong to China. A male panda often performs a “handstand,” getting his rear end higher up the tree so his scent mark will be higher. The panda with the highest scent mark may be seen by others as the biggest—or at least the tallest—panda. Pandas are powerful and unpredictable wild animals. Pandas look cuddly, but they are bears and should be respected. Bamboo makes up 99 percent of a giant panda’s diet. It is quite high in protein and other nutrients. Sometimes a female can be pregnant with two cubs but only give birth to one— her body reabsorbs the other embryo. At only 3 to 5 ounces (85 to 142 grams), a newborn panda is about 800 times smaller than its mother. Scientists have identified 12 distinctive sounds that pandas make. In proportion to body size, giant pandas have shorter legs than other bears. The front legs are longer than the back legs. Giant pandas have a proportionally larger head than most bears. If my pictures aren’t enough to convince you to go see the Barlin-Kahn Panda Trek, then why don’t you watch the Live Panda Cam streaming from the San Diego Zoo? It’s really great – you can almost always see Bai Yun sitting in what must be her favorite spot with a stack of bamboo!! On a more political note, I was surprised to find that Panda Bears are sometimes considered “Tools of Chinese Diplomacy.” The article I read was from Time Magazine, where I found out that Pandas are also growing into a tidy business for China. Rather than donating the animals outright, Beijing loans pandas to foreign zoos for 10-year stints. The rental bill charged by the Chinese government amounts to $1 million a year per pair, and that doesn’t include the hundreds of thousands of dollars needed for the animals’ upkeep. Conservation is poorly funded in China, and the nation’s wildlife authorities count on foreign infusions of cash for panda research and habitat protection. In addition, any cubs born overseas must eventually be returned to China. After all these years, the panda remains a political animal.